Whether you're shopping for a tool to complete a specific project or simply stocking your toolbox, follow these pointers to pick out strong scrapers that will make short work of your next DIY job. Removing old wallpaper, filling nail holes, and prying off hardened putty all rely on one simple and supremely handy tool: a scraper. But depending on which DIY job you’re gearing up to tackle, you’ll probably need a specific type of scraper, be it a flexible putty knife or wide-blade beveled scraper. No matter how versatile a blade may be, there’s no one-size-fits-all scraper for every task on your to-do list. Variables such as blade size and material, style, and handle design have given rise to the staggering number of scraper options that fill an aisle at your local home improvement store. While you can find inexpensive plastic scrapers for around a buck that can handle the occasional one-off task, a scraper that gets the job done easily—and holds up for all future jobs—ranges from around $7 to more than $20, depending on its quality and purpose. Read on to learn which features are worth investing in so you can choose the best scraper for your project. Just as the size and scope of projects differ, so do the sizes of scraper blades. Standard blade widths start at ¾ inch and run up to 4 inches; blades wider than that are typically labeled as “joint knives” and are flexible for working with drywall compound instead of scraping. Generally speaking, tasks like scraping small areas or applying dollops of putty with precision require the use of a stiff, more slender blade. A tool as slim as the HYDE 2-Inch SuperFlexx™ Stainless Steel Putty Knife works well for scraping around staircase balusters or along strips of window trim. While larger blades do the same work and can remove wider strips of paint, thereby reducing the amount of time spent scraping, they can’t fit into narrow spots. For this reason, professionals often stock their toolboxes with a variety of blades—if not nearly every width manufactured. It’s a smart idea to do the same if you frequently work on home repair projects. While most metal blades may look the same, the materials’ properties and strengths will vary widely. • Economical scraper blades are often made from carbon steel, a metal with a nice flex for filling nail holes or applying compound to drywall seams. Wash and dry these blades immediately after you finish your project, though, because carbon steel has a tendency to rust. • Stainless steel, on the other hand, combines the flexibility of carbon steel with corrosion resistance. Take the HYDE 1-1/2-Inch Flexible Black & Silver Stainless Steel Putty Knife, for example. With a cutting-edge blend of flexible steel and Rockwell hardness, this little putty knife—or even any other size blade in the Black & Silver Stainless Steel collection—has just the right amount of flexibility for smoothing spackling and putty into holes, and doesn’t require difficult cleanup. Even dried-on putty falls right off after a job, just by flexing the blade. • Brass blades are ideal for use around flammable materials, such as lacquer or chemical fumes. 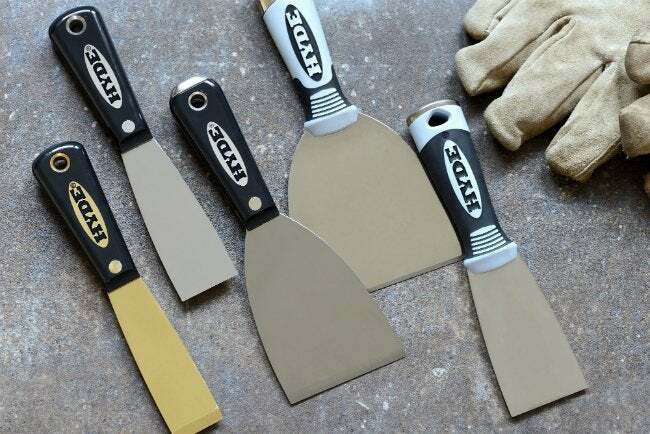 When scraping paint from metal in unpredictable situations, a high-quality, non-magnetic brass blade like the HYDE 1-1/4-Inch Stiff Brass Black & Silver® Putty Knife will not spark. After you get past a blade’s material and size, you’ll notice differences in its flexibility and its edge. When you press the blade against a surface and attempt to bend it, you’ll notice that a product with a ground blade shows some give and tends to be better suited for the pulling motion used when spreading. Such flexible blades are also often called “putty knives,” because they’re primarily used for filling holes and applying compound smoothly over drywall seams. Scraper blades that remain rigid during this flexibility test have not been ground and are sturdy enough for the pushing action that removes old paint and putty. For the most effective scraping power, choose a stiff blade with a beveled (angled) bottom edge that slips easily beneath thick layers of old paint to lift with ease. Chisel-edge scrapers like the HYDE 3-Inch Black & Silver® Stainless Steel Chisel Scraper offer an altogether different edge variation in which a slanted blade makes it easier to scrape away paint from inside corners. 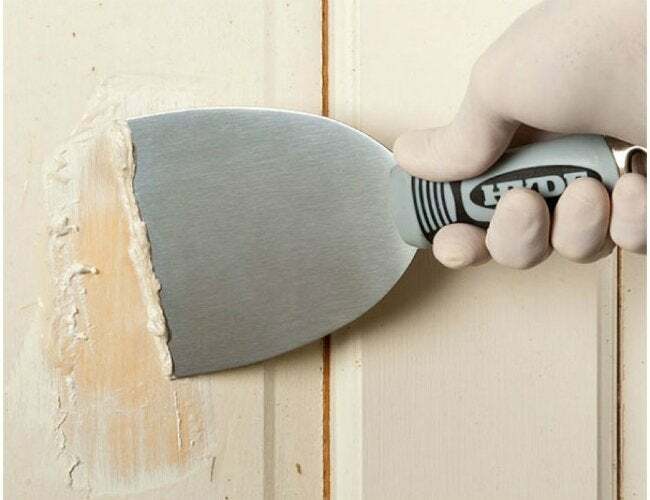 By positioning the longer side of the blade in the corner while scraping, you’ll get optimal paint removal without scraping up your knuckles as you go, thanks to a design that keeps your hand farther away from the wall. Though possibly the last thing you think about, the handles and grips on putty knives and scrapers are the features that offer you the greatest control over the tool. Some of the most worthwhile options are quality construction, comfortably cushioned grips, and sturdy metal endcaps. • If you’re looking for a scraper with a wooden handle, opt for “full tang,” or “solid tang,” construction, in which the back end of the blade extends fully into the handle. This design makes the blade more secure and less likely to loosen and come apart as a result of exposure to moisture or the stress of scraping. Once a handle is loose or broken, the scraper is useless. • Overmold handles are often cushioned and contoured to fit your grip for a more comfortable and secure hold on the tool. Grips like those on the HYDE 4-Inch Stiff Pro Stainless Scraper reduce the amount of stress placed on the hand during large scraping projects. HYDE’s premium-quality Pro Stainless line comes with a lifetime guarantee, so you know the scraper will last for years. Though these tools are designed for professionals, handy homeowners who do a lot of taping, scraping, or plaster patching can’t go wrong with a few of these quality scrapers in their toolkit. • Hammer Head handles feature a small steel endcap that makes them indispensable for many DIY projects. Tap the endcap lightly with a hammer to assist in loosening stubborn putty, or use the endcap to set nails. For example, if in the middle of a paint-scraping job you run across a popped nail, you can simply flip the scraper around and use the Hammer Head to tap the nail back into place. Of the many variations of scraper handles available, you can find options that combine the Hammer Head endcap with an overmold grip, or the Hammer Head and a full-tang design. To make sure you ultimately select a quality tool that will do the job, don’t skimp: Choose one with the benefits of two of these three quality features.